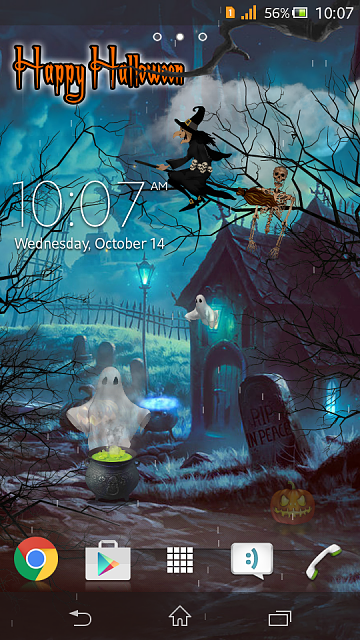 [Android] [Free] Halloween Live Wallpaper - Halloween Discussion Forums, Costumes, Horror! Horror Halloween Live Wallpaper is a fun, spooky way to celebrate the holiday! A dark, creepy graveyard that is home to a magical, ghost, witch. If you are using Android phone, please feel free to try it and give rating and comment. Halloween is coming... Please feel free to download the Halloween live wallpaper to celebrate the holiday. If you're really concerned about app permissions or/and very like this live wallpaper. You can give me support to purchase the "Full" version for a very low price. I appreciate that you give me this opportunity to use my live wallpaper. Thank you so much. Please feel free to try the Halloween live wallpaper to celebrate the great holiday. And also, I update the Full version Halloween live wallpaper such as added one more scene, animation, etc.